Several hop components have potential impact on beer haze, especially in craft beers. To analyse beer haze, a team of Dutch researchers developed a novel analytical method for beer haze profiling using a technique known as AF4-UVFLR-MALLS-dRI (untraviolet, fluorescence, multi angle laser light scattering and differential refraction-index detection). In contrast to its complex moniker, sample preparation is fast and easy. Unfortunately, the method unravels if the haze is composed of polysaccharides, proteins or polyphenol structures of certain molecular weights. 1888 - George Eastman patents "Kodak box camera"
1929 - John Clifton Bogle, future founder of the Vanguard Group of Investment Cos., is born in Montclair, N.J. The beer is brewing and the doors are officially open to the new Stone Brewing – Napa, a 9,500 square-foot restaurant and 10 barrel brewery in an iconic 1877 stone building. Stone brings its flavorful craft beer to the region well-known for its amazing wine and cuisine, offering visitors locally-brewed beers, a dining experience, growler fills and Stone merchandise, Brewbound reported on May 8. Rocket Frog Brewing Company will hold a grand opening celebration May 19, following a soft openings events beginning May 5 for Launch Pad Society members, Loudoun Now reported on May 7. Minnesota’s first Latino-owned beer company will soon have a physical cervecería and taproom to call home, The Growler reported on May 8. La Doña Cervecería founder Sergio Manancero, son of Uruguayan immigrants, former Marine, and University of Minnesota alum, has set his sights upon Minneapolis’ Harrison neighborhood to build a brewery and taproom for his company, which started producing a line of Latino-influenced beers in 2016 under a contract brewing arrangement with Sand Creek Brewing in Wisconsin. A new craft brewery in Denver celebrates Mexican flavors and focuses on bridging the gap between communities in the United States and Mexico, 9News.com reported. Cerveceria Colorado, a concept from Denver Beer Co., had its grand opening on Saturday, May 5. The new brewery took the place of Denver Beer Co. Barrel Room at 1635 Platte St.
Head Brewer Jason Buehler has traveled to Mexico several times to learn from brewers in the country. “The passion they had rubbed off on me and I brought it back and was sharing it with some of our team here, and we decided this was the direction we wanted to go in and we really believed in it,” Buehler said. “We saw an opportunity to be able to work with some amazing brewers in Mexico and bring some of those flavors and ideas to the U.S. craft beer scene and we wanted to create something that was inclusive,” Buehler said. According to co-founder Patrick Crawford, 20 percent of sales from the first six Fridays the brewery is open will be donated to Latino nonprofits in Denver. Starting May 28, the long awaited Switchyard Brewing Company will open their doors to the public. Opening at 8:00 AM, Indiana University students and the Bloomington entrepreneurship and remote workforce communities will have a place to build their future in the morning and celebrate their successes in the evening, TheFullPint.com reported on May 7. “Switchyard started as a Bloomington garage startup”, says Kurtis Cummings, Founder of Switchyard Brewing. “We believe that business can, and should be a catalyst for positive change within our community. We feel we are doing our part as a downtown business by helping to advance Bloomington’s entrepreneurial, tech, and creative communities by designing our taproom around this idea.” With an open floor plan, ample table space, whiteboards, a conference room, and gigabit internet service – Switchyard truly was built for business. River Road Brewing & Hops has opened the doors to their tap room and retail shop at 35449 Bayfield River Road in Bayfield – part of Huron County, the Ontario Beverage Network reported on May 5. Brewing at River Road began in November 2017 – beers were only available at bars and restaurants in the area until now. The brewery – founded by Nikki and Dave Andrew – is located on a 3 acre farm where the pair have also begun growing hops and barley. Three beers are currently available through the retail store in 355ml cans – Blind Descent Oatmeal Stout, Spring Blonde, and River Road Blonde. Operating hours are Fri 4-8pm and Sat 12-5pm. Popular brewery Rivertowne Brewing has filed for Chapter 11 bankruptcy, WTAE Pittsburgh reported on May 8. The Westmoreland County brewer and its four restaurants filed for protection from creditors under Chapter 11 of the U.S. Bankruptcy Code. The brewery is citing intense competition in the craft beer industry. Rivertowne Brewing says its restaurants in Verona, North Huntingdon, Monroeville and the North Shore will continue to operate while the company reorganizes financially. A turnaround plan is due to be filed with the court by September the PG reports. Gibb's Hundred Brewing Company may reopen its taproom by the end of week, News&Record reported on May 7. Owner Mark Gibb said he hopes to have a soft opening on May 11 at the brewery’s new location at 504 State St.
“We’re working on a couple of inspections and ABC permitting, but hopefully everything will come together by the end of the week,” Gibb said. The new 10,000 square-foot location in a former warehouse will feature a 2,000 square-foot tap room and outdoor beer garden. Gibb said it will be a few more weeks before the brewery is producing again, but a sustainable amount of beer was brewed before equipment was moved from its former location at 117 W. Lewis St.
“We have a good supply of beer to serve folks,” Gibb said. Gibb said the brewery’s patio will be open minus the landscaping, which will be in place in the coming weeks. Once the brewery is up and running to full capacity, Gibb plans to partner with local restaurants to deliver food to the taproom. Gibb’s Hundred Brewing opened three years ago in downtown Greensboro. Owner Mark Gibb announced last fall he would relocate the brewery to a new site to accommodate increased wholesale production. The production of Tree Brewing beers is soon moving from its Richter Street location in Kelowna to the big city, the KelownaNow reported on May 4. Tree has entered into a joint venture agreement with Big Rock Brewery and the production of Tree beers will soon be transferred to Big Rock’s Vancouver location. Have no worries if you’re a fan of the Tree Beer Institute on Water Street, however, as nothing will be changing there. Stirling also said that the institute will continue as the brewery’s source of innovation, and what people like and respond to there will be considered for a more widespread, canned production. The move allows Tree to remain a player in what is a very competitive craft beer market, and allows the brewery to continue its growth by tapping into Big Rock’s resources. Stirling wanted to emphasize that the move will in no way affect Tree beer. Pete Coors, the chairman of Molson Coors’ board of directors, didn’t appreciate some of the comments that were made about large brewing companies during last week’s Craft Brewers Conference, Brewbound reported on May 7. “The leadership of the Brewers Association does a great disservice to the entire beer value chain by attempting to pit one part of the industry against another,” he wrote in the letter, which was first published by Beer Business Daily. Americans are drinking less Budweiser. But India, Paraguay and South Korea are picking up the slack. Anheuser-Busch InBev said on May 9 that overall sales were up slightly from a year ago and beat Wall Street forecasts. Sales of Budweiser fell 1.3% during the first quarter, largely because of the decline in the United States. AB InBev is struggling in America as craft brews become more popular — and the company has tried to cash in by acquiring smaller beer companies like Goose Island, Blue Point and 10 Barrel. Luckily, the company is a global giant. Sales of Budweiser were up 2.5% in the rest of the world because of solid sales from emerging markets in Latin America and Asia. AB InBev owns more than just Bud and Bud Light. Stella Artois sales surged 12% in the quarter, thanks to strong demand in the UK and Argentina. The company also said it was optimistic about its sponsorship of soccer's World Cup, which will take place in Russia in June and July. A small band of Belgian monks are planning to start producing their own beer again, more than 200 years after invading French troops stopped all brewing at the abbey, Reuters reported on May 7. After that, some of the world’s biggest drinks brands filled the gap – Heineken unit Alken-Maes makes brown and blond lagers with the Grimbergen brand in Belgium. Carlsberg sells them abroad, paying royalties to the abbey. 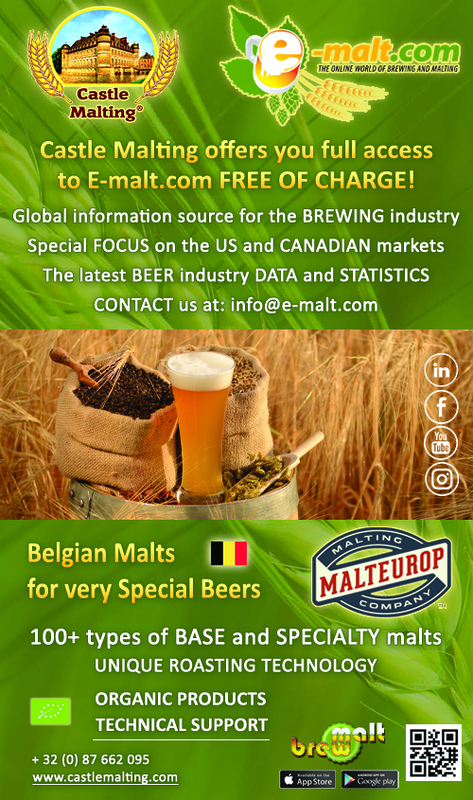 According to Research & Markets, the Europe beer market is expected to grow at a CAGR of 6.2% during 2016-2022. Changing consumer preferences and improving lifestyles have led to the growth of premium beer products. That doesn’t mean there are fewer options available for the price conscious. Krakow, the ancient Polish city, serves beer at less than £1 a pint. Consumers prefer different types of beer, ranging from colored ales, lagers, and white varieties, depending upon price, taste and social status. The European brewers are also making huge investments to satisfy consumers’ changing tastes and preferences, Insider Monkey reported on May 5. 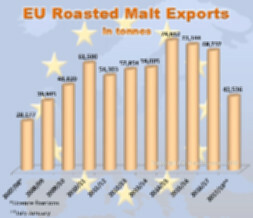 Beer not only defines Europe’s social and cultural landscape, but the brewing sector also contributes significantly to the EU economy and is also a major exporter. The European Union is the second-largest beer producer in the world, after China, with more than 6,500 active breweries. 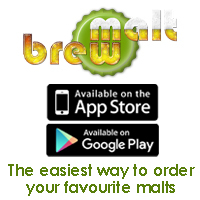 The European beer industry generates about 2.3 million jobs throughout the entire value chain. The 12 best selling beer in Europe thus spells out the European success story and contributions made towards the different facets of the economy. In March 2018, UK brewers, maltsters and distillers used 160.1 thousand tonnes of barley, 3.7% lower compared to March 2017, AHDB reports. Spring barley planting in Ukraine is drawing to an end, and the forecasts about its shortfall are coming true, UkrAgroConsult repoted on May 8. Russia's beer producers have reportedly sent letters to local and federal officials urging them not to restrict the sale of alcohol during the 2018 World Cup, The Moscow Times reported on May 9. Regional authorities are pushing to restrict the sale and consumption of beer during the international football tournament, which takes place in 11 Russian host cities from June 14 until July 15. In response, breweries are warning officials that if restrictions are put in place, football fans will be in danger of being forced to purchase illegal, hard liquor. Beer producers also estimate that restrictions will cost Moscow alone up to 2 billion rubles ($31 million) in unpaid taxes. The president of the Russian holding of Anheuser-Busch InBev, AB InBev Efes, Dmitry Shpakov sent a letter to vice-president Arkady Dvorkovich on May 4 outlining his concerns about statements from regional governments about possible alcohol restrictions on the territories of the 11 host cities, the Kommersant business daily reports. On May 7, the Russian Beer Union also reportedly sent a letter to Moscow Mayor Sergei Sobyanin with the union members’ concerns about potential restrictions on beer sales and consumption in the Russian capital. Farmers in South Africa have filed a complaint with the country’s competition watchdog about Anheuser-Busch InBev’s decision to change its pricing formula for buying malt barley, a key ingredient in beer making, Reuters reported on May 7. The farmers lobby group Grain South Africa believes AB InBev, the world’s biggest brewer, has contravened one of the conditions set when the country’s competition tribunal approved its $106 billion acquisition of rival beer maker SABMiller. 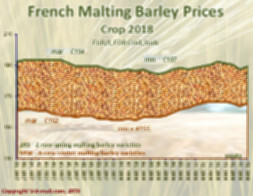 In a letter to farmers in the barley growing region of Western Cape province, AB InBev said it was changing what it will pay for the 2018 crop to 97 percent of the price for top grade wheat (B1) from 102 percent of second tier wheat (B2). The recently signed Comprehensive and Progressive Agreement for Trans-Pacific Partnership (CPTPP) provides significant new market access opportunities for the grain and other agricultural industries in Australia, according to a May 4 Global Agricultural Information Network (GAIN) report from the U.S. Department of Agriculture. The CPTPP will eliminate more than 98% of tariffs in the TPP-11 markets, which include major markets such as Canada and Mexico, the report said. “The CPTPP creates Australia’s first free trade agreements with Canada and Mexico, giving Australian exporters preferential access to two of the world’s top 20 economies for the first time,” the USDA said. An analysis by the Australian government concluded that the CPTPP will eliminate tariffs on more than $2.5 billion of Australian agricultural products. The USDA noted that the agreement provides improved market access into the Japanese market for wheat, barley and malt. Scotland introduced a minimum price per unit of pure alcohol on May 1. The move is aimed to curb the sale of cheap and strong drinks, the Deutsche Welle reported. India’s B9 Beverages, which sells the popular Bira 91 brand of beer, has just completed its largest round of fund-raising, and is now preparing to more than quadruple its production, Quartz reported on May 8. On May 8, the New Delhi-based company announced that it has raised $50 million (Rs336 crore) in a funding round led by Belgian investment firm Sofina, and existing investor Sequoia. B9 will use the majority of the cash to fulfil local demand, investing in existing and new manufacturing facilities, apart from expanding in the US and Southeast Asia, its founder and chief executive officer Ankur Jain told Quartz. Bira 91 was launched in early 2015 to “fill the gap in the market for a trendy, unorthodox, fun, and smart brand of beer that could be positioned between Indian brands and the expensive imported beers,” Jain had said then. Its investors include Sequoia, TR Capital, Snapdeal’s Kunal Bahl, and Zomato’s founder Deepinder Goyal, among others, who have put in $100 million into the venture so far. Beijing craft beer lovers have been handed yet another reason to drink their sorrows away this week as a shock announcement from Great Leap Brewing (GLB) details the closure of their flagship #12 Xingfucun location this Thursday, May 10, The Beijinger reported. The message, which came via the brewery's official WeChat account just after noon on May 8 and written by Great Leap Brewing's co-founder Carl Setzer, states that the brewery is being forced out of the location on account of the landlord being "adamant that there will no longer be tenants using this property for any and all food and beverage services." The crackdown on F&B in the space has forced the GLB team to reach a compromise and reconsider how it will be used in future, adding that they do not intend to give up the venue entirely but instead will repurpose it for the business. In doing so, it will become home to their corporate operations, a cold storage distribution centre, and office space for the staff. Corporate giant Lion has caused a stir in the craft beer world with a move to try to trademark the word "dank", the New Zealand Herald reported on May 6. Traditionally a slang term for describing pungent marijuana it is now commonly used by craft brewers to describe strong, heavily-hopped ales. Not to be confused with the Kiwi slang term "dak", the original meaning of "dank" was simply something damp and musty. Craft beer fans were up in arms when Lion's trademark application was posted on the Beertown Facebook page last week. "Dank, dankier, dankiest. Lion is attempting to trademark DANK as a beer descriptor. Anyone think that's a bit rank?" the Beertown post said. Lion confirmed it was seeking the trademark for the term but reassured that it would not prevent other brewers from using the term. "We have noticed some concern around Lion's Trademark application for Dank," the company said. "It is correct that we have applied to trademark Dank for possible use as a brand in a new beer range ... It's incorrect though, to say that by registering Dank, we're seeking to prevent the use of the word by other brewers."